Is it necessary any kind of previous sailing experience? 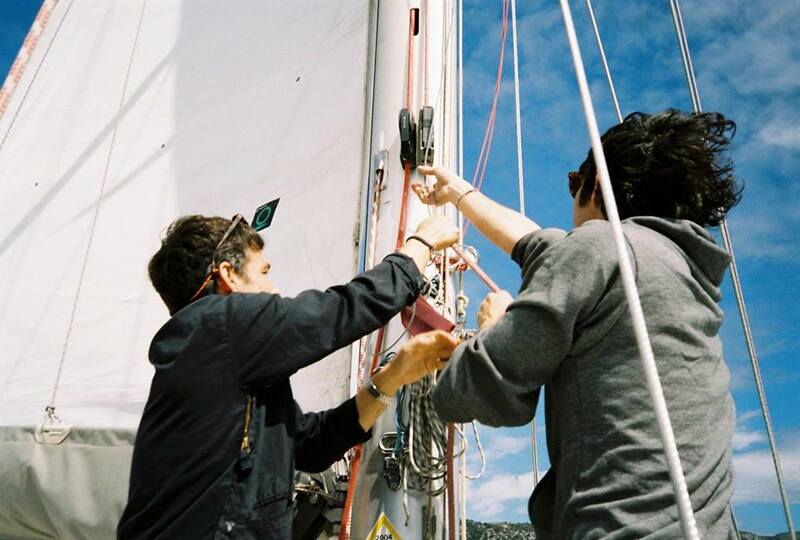 No experience is needed, you don't need to know anything about sailing or the sea to join the boat. We do ask for a little adventurous soul. We can control the boat, but we can't control Nature. Sometimes sea is not perfect, and we need to understand that it is part of a sailing adventure. For one day sailing plans, you can be 7 persons. Insurance covers 7 persons + the captain. Can I come alone or just with a friend, or do I need to bring my gang? Most of the time people make their own friends combination. But if your friends are not that much into the sailing idea, and you still would like to come, I regurarly make crews myself, I would look for your sail partners. How many crew members there are on board? Me, I am the skipper. I normally take captain and cook jobs. Sometimes, depending on the trip, I hire another person to assist me. So, máximum 2 persons. Can I help with the sailing work..., boat's manouvers, etc? You do can help. There is always a way to help, related to your previous experience. Normally everybody helps a lot at the end of the trip, after learning as much as they desired. You can also lay on deck while others do :) !! Are there High / Low season prices? Yes, you will see prices are different each period of summer, or even off-season. How much are the expenses when they are not included in the price? Depending on the plan, expenses may be included or not. This is clearly specified in every plan. When included in the price, what you pay at the beginning is all you’ll spend aboard. When not included, price is for the boat rent, captain fees, VAT taxes and insurances. The not included expenses would be: food, harbour fees, laundry, fuel, and some boat expendables. After many trips, I have calculated a guess. An average is about 180€ - 260€/pers x week. Do I need to buy the flights and transports to get to the boat? Where will I have to fly? We don’t provide flights or other transports to the boat. You would need to look for them. The boat uses to be in the island where we will be sailing during the trip. Normally we dobble check flight details together to avoid mistakes. Usually I will provide you all the local transport details to get to the boat from the airport. How does the payments procedure work? You will need to provide 50% of the total amount as a reservation deposit. The other 50% would be paid one month before the trip starts. In canceled trips within minimum one moth in advance, a 15% of the trip would be charged. In canceled trips within less than one month in advance, a 50% of the trip would be charged. In canceled trips within less than fifteen days in advance, 85% of the trip would be charged. In any of the cancelation cases mentioned, If I find a new crew for the cancelled trip, any cancellation fee would be charged. The boat would not leave the dock if there is any kind of payment pending. Narinan is a Spanish commercial declared boat, fully taxed and covered for professional use. I will always give you the invoice at embarkment. Who is going to cook and who does the shopping? By the way, a boat’s kitchen is called “galley”. In a galley, the fridge is not very powerful, that’s why we normally concentrate very fresh food and fish dishes on the first two days. We also will eat very fresh viands, salads and nice and healthy pasta or rice recipes. Wherever we sail we buy as much of fresh and local provisions. Normally it’s me who goes to get them, so when you arrive we can leave inmediately and go direct to sea and enjoy sailing as early as possible. If there would be any problem during the day before, or maybe it was a bank holiday, we would go shopping together next day, during your first day’s morning. What can I eat if I am vegetarian or vegan? Narinan’s menu is quite flexible. We will always be able to turn it vegetarian or vegan with a small twist, or make it a little personal for you. You would need to tell me about it before I go to do the shopping. Will we stay at sea all the time? We will merge both sea and land activities. Also in summer, we will go to land daily. Sometimes it will be in the wild, some other times to a harbour, or a town. But normally we can go inland and walk daily. Can I use the dinghy myself? “Narinet” can be operated with a small outboard engine, or rowing. If you know how to row and sea conditions are in favor of rowing, you can use it by yourself. If there is the need to be used with the engine, it’s me who will take you wherever you would need to. Taking or picking up the crew to wherever they like to go, at any time, it’s part of my job. I am always happy and ready to do it. Do you have a Paddle Surf or Kayac? We have a Paddle Surf and a Kayac. It's very nice to go on small expeditions around the small bays, on your own. Will we recycle the bin? Recycling starts by thinking carefully about what products we buy at the supermarket and how to recycle them on board. I'll buy products than can be recycled easily such as glass jars and tin cans. You would have to make sure you put them in the right bin after you use them. Please ask me if I have forgotten to tell you where is each kind of separated bin. What about cleanning the boat? During a trip, usually I do most of the cleaning, but I will ask for help If I need to. What about cleanning the linens, the laundry, do I have to bring my own? The boat has got her own linens. I'll take them to the laundry when you leave. Laundry prices are not included and may be different in every port. I'll tell you how does it cost before you leave. You can bring your own linens if you would like to. Are there any kind of boat use guide lines? A boat is a tiny and fragile place, in a unstable and changeable environment. These guide lines are basically to keep the boat in good conditions, always ready to set up sail, and to ensure a perfect cohabitation in such a small home. Smoking: Smokers are welcome. You can smoke in any place on deck. There are a couple of sailor ashtrays. Please ask for them. About wet bathing suits and the interiors sofas: I will ask you to wear a totally dry bathing suit if you would like to sit in the interior sofas. The reason is that once they get wet in salt water, they never really go dry again, there would be always remain a kind of humidity where you would had sitten. That is why the "Summer Tips" is recommend to bring more than one bathing suit. About sun-screen lotion and the interior sofa's: There is no problem to lay on the sofas just on your bathing suit and covered in sun-screen lotion :) There are a few 'pareo', beach shawls, to cover the protect the sofa before you lay on it. I would ask you to do that, the reason is that oil stains are difficult to get rid off, and the sofa wiuld be a mess. About going to bed and tidying things up? When we go to bed, no matter what time is it, we need to tidy everything up. The reason is that we are in a boat, it's mainly about safety. Even when the sea is very quite, there are some nights every summer, that it could unpredictibly get a bit rough. At that point we should weight fast the anchor and go to a better sheltered place. For safety reasons everything on deck, kitchen and common spaces, would need to be tidied up before we go to sleep. Doing the dishes: Sea is a quite unstable and changeable evironment. Dishes would need to be done after the meal. On boats we do the dishes in a peculiar way. To be able to make fresh water last for the entire week, we have a dedicated sea water tap in the sink. They are washes on sea water. In order to get rid of the salt, sea water washed dishes need to be dried by hand. This means that the best thing to do the disehes in a boat i to do it with somebody else. Doing the dishes is a two persons team job. While one sailor cleans, the other one dries. The job finishes when everything is dried, securely stored down and the drying clothes are hanged up in the sun. I have to say I am not very into fishing, but in the boat you will find all kinds of fishing gear, rods, etc. If you would like to fish, you don't need to bring any. There is not a spearfishing gun. There are masks and very good fins, but if you like spearfishing you would need to bring a gun. No fishing or spearfishing from Narinan will be practices in protected areas. Is it possible to charge my mobile phone, tablet, computer, camera...? You can always charge your mobile phone or any device with USB charger, all the time, as much as wanted. For 220 volts devices, like computers, we can only charge them when the engine is running. This is maybe during around one hour per day. I will keep updating this section with the most frequently asked questions. Please, do not hesitate to contact me if you have any doubts.